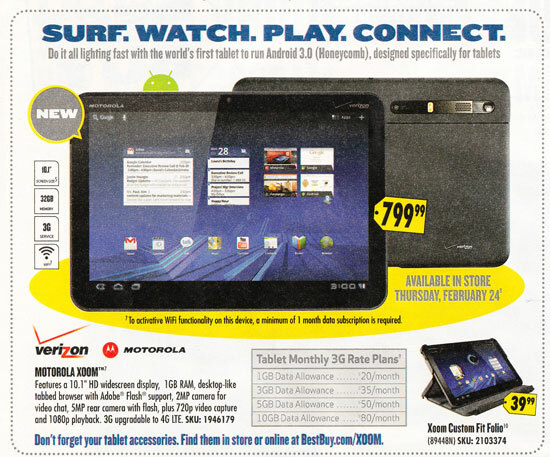 According to a flyer put out by Best Buy today, the Motorola Xoom 3G/4G will be available in stores on February 24th for $799. As previously rumored, buyers will be required to purchase at least a one month data subscription in order to activate Wi-Fi on the device. A silly requirement, but given that there will also be a $600 Wi-Fi only version of the Xoom (release date has not been announced), it's hard to imagine why anyone would buy the 3G/4G LTE version and not activate service. At $799, the Motorola Xoom is more expensive than the 32GB iPad at $729. But feature-wise, the Xoom far exceeds the iPad with dual-core processors, microSD support for up to an additional 32GB of storage, a 10.1-inch widescreen HD display (1280x800) and a front-facing 2MP camera for video chats, as well as a rear-facing 5MP camera that captures video in 720p HD. And while the Motorola Xoom will launch as a 3G device, it will be upgraded to Verizon's 4G LTE network this summer, according to Motorola—another leg-up on the iPad. When (if) the iPad 2 launches in a month or two as expected, we will have to see if the Xoom still holds it's feature advantage (and price disadvantage). And with more tablets coming to market from Samsung, HP and others, we'll see how long to premium Motorola pricing can hold. UPDATE: To clarify for the comments below, we received a physical copy of the printed flyer this morning (2/19) in the New York Times. The image you see above is an actual scan we took of the flyer, it is NOT a reprint of "leaked" images other sites have previously published. I’m all for feb 24 release date but unless best buy messed up with their flyer that much i’m not sure if I trust it. Any link to the ad that was put out today? I can find no such ad. The ad referred to here looks like the same one that was put out several weeks ago. Yeah, I’m wondering if this is the same leaked image. I want to see something like a picture taken of the ad. Just scouted out the circular which is available for viewing online. It has no page for the Xoom. As much as I wish it were true so we could start to see some real release details for Honeycomb products it still remains to be vaporware. This ad flyer came in the NY Times this morning. This is an actual scanned image we made of the ad. Just pre-ordered my Xoom. Here’s to Honeycomb sweetness! The douche in the movie is not even interfacing with the tablet! Why is Moto running a “movie” on the Xoom when they are supposed to demonstrate it? Lost some creds with me at least. I see a lot of attention being paid to the cost of the Xoom. I guess I have a hard time understanding that. When the iPad with 3G and wifi with 32 GB storage and, Apple being Apple, youve got to get adapters that cost anywhere from $40 to $70 to connect cameras and external video, with no cameras, slower processor, lesser video, less RAM, etc, etc costs $729 to start with plus the extra, how is $799 a bad deal. Just curious folks. Pass the kool aid. @Scott, I want to mention that he’s right on all accounts. Many forums do want to compare the Xoom to the iPad now. When posters realize that it doesn’t make sense to compare it to the iPads that are out now, they instead compare the Xoom to the next gen Ipad which does have a camera and I think it will probably have 4G. For now the Comparison might be close enough that iProduct users will not see the need to reconsider their options. The problem is with Apples need to stay with their business model which has them releasing its new version yearly on the dot. So this year, Honeycomb products beat apple to the chase by 2 months if they decide to stick to the April release date. By Christmas, tablets will start using Quad core tablets. Again if Apple sticks to their yearly release, Android will have beaten them to the punch by even more time, this time by around 5 months. Apple may be a quality products, I’m not arguing that. What I’m saying is that Android products at their current rate are going to outpace them in what they can do and there are no signs that shows that slowing down.